As Yvonne Potter tells it, the call for this dream commission came out of the blue on a February day in 2011. 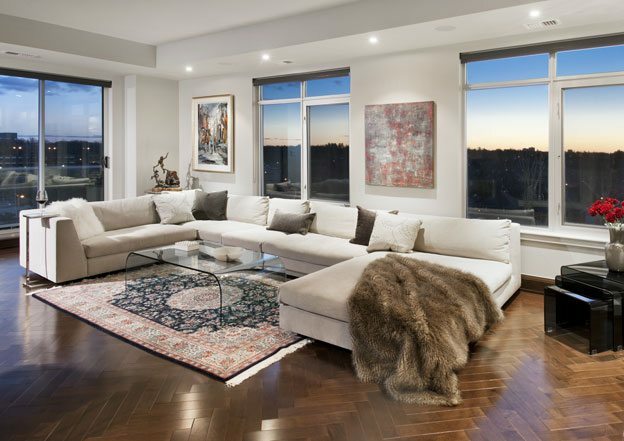 A pair of homeowners, with three children, were ready to swap their 6,500-square-foot waterfront property for a more manageable 3,300-square-foot penthouse condo in the city. 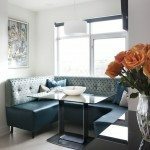 Would collaborators Yvonne Potter (of Yvonne Potter Interior Design) and Karyn Watson (of Karyn Watson Design) be interested in helping them combine three condos into one, customizing the look every step of the way? Of course! The setting for this two-year project was the top storey of Domicile Development’s One3One condo in Hintonburg. Construction on the building had not yet begun, and the owners were keen to buy three of the six units to be built on the eighth floor, turning them into one sunny apartment with room to sprawl (and host the couple’s children when they came to visit). Potter and Watson began by looking at the big picture — the volume of the space, the light, and how the rooms would interrelate — before moving on to the details. 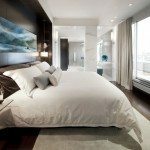 Over the next two years, they would re-envision the entire condo from floor to ceiling, working closely with the owners to customize every aspect. Because the condo has expansive windows on three sides — to the east, west, and south — Potter and Watson oriented the rooms according to the couple’s schedule. Being morning people, they opted to situate their kitchen and master bedroom to welcome the rising sun, while the main wall of windows in the living room faces west, allowing the owners to appreciate the sunset as they relax after supper. The generous living room is the showpiece of the home, a room that is both warm and comfortable, anchored by an ample Ligne Roset sofa and an extended fireplace that does double duty as the “wall” for the flat-screen television. Deep maple flooring is laid in a herringbone pattern, delineating the room and giving it a touch of European flair. Potter and Watson worked with German furniture maker Gregor Bruhn of handwerk to plan the wall-to-ceiling shelves that showcase the couple’s porcelain and glass collections. Behind the fireplace, a glass wall defines one side of the home office. While the glass allows natural light to enter the room (which has full walls on the other three sides), the fireplace provides a natural divider, so family members can be in the living room without distracting him when he’s working. Click on the thumbnails for a slideshow of images from this home. The kitchen has a mid-century modern vibe, the design led by the textured backsplash tiles ordered by Potter months before the room was built. 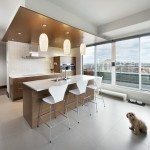 Because the kitchen is open to the breakfast nook and dining room, she made the space cozier by “wrapping” the working area with walnut cabinetry and a drop ceiling. The marble pendants above the island are striking in their simplicity. “It was important not to compete with the dining room chandelier,” Potter explains. The breakfast nook, located directly across from the kitchen island, was one of the owner’s must-have elements. The intimate eating niche allowed Potter to design a custom banquette with leather and velvet upholstery, as well as the distinctive glass-topped table, its steel base fabricated by local artist and blacksmith Cairn Cunnane.